Jamaica necklace, OTF5-27, Hookster® by MS V Designs™, Five strand versatile fashion necklace. With the Hookster®, Experience the Value of Versatility, Exclusively from Ms V. Your Belt, Necklace, and Bracelet All In One!™ Red, gold, light yellow beads and chains with circle and oval shapes. 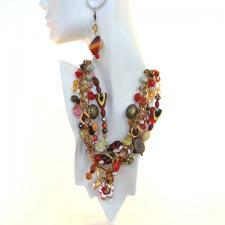 This beautiful piece can be used with warm toned outfits, excellent for casual evening.